We’d love your help. 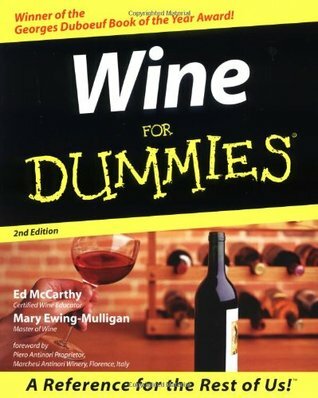 Let us know what’s wrong with this preview of Wine For Dummies by Ed McCarthy. 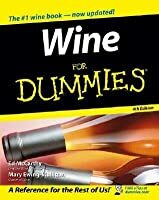 Savor the glories of the grape in this all-new, revised and updated edition of the best-selling Wine For Dummies. Even if you've never sipped a glass of wine in your life, a wonderful world is awaiting as you find out how to taste wine, what types of grapes are used in the wine-making process, and how wines are named. 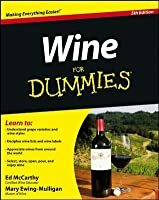 A little knowledge, say husband-and-wife authors Ed McC Savor the glories of the grape in this all-new, revised and updated edition of the best-selling Wine For Dummies. Even if you've never sipped a glass of wine in your life, a wonderful world is awaiting as you find out how to taste wine, what types of grapes are used in the wine-making process, and how wines are named. A little knowledge, say husband-and-wife authors Ed McCarthy and Mary Ewing-Mulligan, can go a long way in enhancing your delight and appreciation of wine. To ask other readers questions about Wine For Dummies, please sign up. A good comprehensive guide, liked the humor, and the narrator was easy to listen to. Learned that there actually is a reason to sniff, swirl, and let wines breathe. If not for this guide, I would've dumped out a whole bottle Precipice Pinot Noir after the first sip. It tasted so much better after an hour of letting it breathe. Also learned a lot about champagne that I didn't know, like how "sparkling wine" IS champagne that's not produced in Champagne, France. I thought they were different. Mind A good comprehensive guide, liked the humor, and the narrator was easy to listen to. Learned that there actually is a reason to sniff, swirl, and let wines breathe. If not for this guide, I would've dumped out a whole bottle Precipice Pinot Noir after the first sip. It tasted so much better after an hour of letting it breathe. Also learned a lot about champagne that I didn't know, like how "sparkling wine" IS champagne that's not produced in Champagne, France. I thought they were different. Mind blown. Overall this is a good book, worthy of a four star review. The reason for my two star review is because of Chapter 7, Confronting a Restaurant Wine List. This is the one chapter that obviously is written by people who don't have experience in the area they are talking about and didn't bother to consult with people who do before making some bold assumptions. This chapter is full of misinformation, negative assumptions, and directions on how to conduct yourself in a restaurant that if followed, ma Overall this is a good book, worthy of a four star review. The reason for my two star review is because of Chapter 7, Confronting a Restaurant Wine List. This is the one chapter that obviously is written by people who don't have experience in the area they are talking about and didn't bother to consult with people who do before making some bold assumptions. This chapter is full of misinformation, negative assumptions, and directions on how to conduct yourself in a restaurant that if followed, make for a less enjoyable dining experience. In short, this chapter tells you to be infuriated by a lot of things that are just standard restaurant protocol. 1. It starts by saying that it is infuriating that wine lists sometimes only tell you the name and price and that sometimes they won't have the wine you ordered in stock that night. Well, if a wine list with 500 bottles had an extra two lines describing each bottle, the list would be so overwhelming and take forever to get through. You could have 50 Cabernets in a row that all say "Notes of chocolate, leather, cassis and tannins". You're going to judge the wine by the familiarity with the producer, vintage, region and questions you ask your server. The wine you ordered could be a bottle that customers rarely order, but randomly the previous night a large party ordered all the bottles in house and the restaurant had to place an order and wait 3 business days to get more. It happens no matter how nice and on top of things a restaurant is. It's not because they don't care, forgot to place an order, or just didn't bother to update the wine list, as the book suggests. 2. They also tell you to ask your server how long the bottle of wine has been opened if you decide to do wine by the glass. They say that no wine is fresh enough to serve the next day. Well, in reality all decent restaurants keep track of when their bottles were opened and gas their wines at night or have them hooked up to machines that air seal the wine. If it tastes old, you can ask your server about it. But don't automatically ask every single time you order a glass of wine. That's just tacky and a good way to kill rapport early on in the dining experience. If you do ask, ask them to check with the bartender on when the bottle was opened. Don't just expect them to know the exact time that all 22 wines by the glass were opened. 3. This chapter also tells you to be upset if only one wine list is presented to the table and demand more because that is an "outmoded convention". Wine lists are big books that restaurants don't have as many of as they do menus. Usually even though a discussion happens, one person decides on the bottle. The server isn't trying to be sexist or old-fashioned. You can ask for another list, but don't waste energy being negative over something that isn't insulting. You'll be annoyed every time you go out to eat before you even get water service if you expect your server to automatically assume everyone needs a copy of the wine list. 4. "Be aware of low to high pricing". This part tells you to be insulted by a wine list that presents the wines in ascending order from lowest to highest price. They say this is done to make you feel guilty and buy more expensive wine further down the list. That is a ridiculous assumption that has 0% base in reality. It's simply not true. People have a price range and a varietal in mind when they walk in. It makes it so much easier for them to look at different wines in their range right next to each other than to be flipping back and forth between pages trying to remember the wines in the same price range. 5. Wine prices versus retail. When you're going out to a nice restaurant, if you sit there and price out how much potatoes cost at Safeway versus your baked potato, a bottle of Absolut versus your two martinis, etc., you'll drive yourself crazy and not enjoy your meal. Yes, restaurants have higher price margins on their wine and liquor, but that is how the business model works, period. Keeping a restaurant profitable is very difficult and they're not doing it to gouge customers. 6. Wine service. There is a section that actually is called "Wine List Power Struggles". It tells you that servers often don't give you enough time before they come back to the table. You need to stand your ground and don't let the server bully you into making a hasty choice. Well, the server comes back to the table after a few minutes to see if you have any questions and then gives you more time. They don't do it to pressure you. Once again, this book is dangerously planting an idea in it's readers minds that could make a dining experience go south from the beginning. If servers always gave every guest 10 minutes to look at the wine list, they would have a lot more customers upset over slow service than they would happy guests who appreciate the extra time to look over the list. If you always expect 10 minutes of uninterrupted time and feel pressured if the server returns after a few minutes, you'll always be disappointed. But it's just standard service. This part also encourages being insulted if women are poured first and if the server tries to refill your glasses instead of letting you pour yourself. If that really is something that bothers you, not just because you read it in the book, then politely tell your server you like to pour for yourself once the bottle is open. But don't wait for him/her to try and then act insulted because they tried to do something that is standard restaurant protocol. Esto de disfruta el vino es todo un arte. Ame este libo que me lleno de cultura sin esperarlo y que me enseña el arte que viven los enologoz en su ardua labor, el vino no tiene truco, ni reglas, solo tenemos que aprender a disfrutar el vino en cada momento. 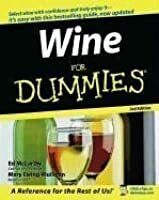 Wine for Dummies is a great book for both the experienced and novice wine drinker. The Introduction goes through how the book is organized and which parts of the book should be read, depending on what the reader is interested in. Pretty much every aspect of wine is covered -grape varieties, how wine is made and regulated in various countries, how to read a wine label or restaurant wine list, and much more. The really technical information is labeled as such and can easily be skipped. I liked that Wine for Dummies is a great book for both the experienced and novice wine drinker. The Introduction goes through how the book is organized and which parts of the book should be read, depending on what the reader is interested in. Pretty much every aspect of wine is covered -grape varieties, how wine is made and regulated in various countries, how to read a wine label or restaurant wine list, and much more. The really technical information is labeled as such and can easily be skipped. Packed with good information. Will make a better as need-to-know resource rather than sit down and read cover to cover. The "For Dummies" series has been an intriguing enterprise. The use of the term "Dummies" could be considered offputting--yet the series has obviously done well, as more and more volumes are developed. I have found many of the books useful to me. And this is another in that group. I know enough about wine to get by. This volume, though, adds a context to my knowledge of wine that I appreciate. The purpose is presented at the outset (Page 1): "We want you and everyone else to enjoy wine. . .--rega The "For Dummies" series has been an intriguing enterprise. The use of the term "Dummies" could be considered offputting--yet the series has obviously done well, as more and more volumes are developed. I have found many of the books useful to me. And this is another in that group. I know enough about wine to get by. This volume, though, adds a context to my knowledge of wine that I appreciate. The purpose is presented at the outset (Page 1): "We want you and everyone else to enjoy wine. . .--regardless of your experience or your budget." The first chapter is titled "Wine 101," and it provides the background to understands wine better. It covers issues such as how wine is made, the difference between reds and whites (and "blushes" or pinks), and such. Chapter 2 talks about the language and experience of wine. It concludes with a nice distinction between good wines and bad wines--with a claim that few wines are really bad anymore. Chapter 3 addresses the variety of grapes that help define a wine (a subject that can confuse)--pinot noir, cabernet sauvignon, chardonnay, and pinot grigio. Chapter 4? "The wine name game" starts the chapter off. Also, there is a section that helps understand the label on the bottle. Etc. Other features: a country by country, region by region analysis of wines. There is, of course, an analysis of French, Italian, German, and American wines. Also, a nice discussion of South American winemaking. There is also a chapter on champagne. The book concludes by looking at answers to ten questions about wine (e.g., What's the best wine?) and addresses what the book considers to be 10 myths about wine (e.g., Old wines are good wines). 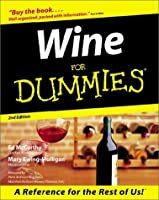 This is a brief introduction to wine for people who normally drink beer, from what glass to use to how to describe flavors this book will help you fake knowledge about wine. Made for the American market for American wine drinkers with only a nod to the most famous European wines, the focus is on Californian wines and Oregon (Really, Oregon? I had no idea they made wine in Oregon). This book will appeal to anyone looking to appear knowledgeable about wine. We listened to the book while driving fro This is a brief introduction to wine for people who normally drink beer, from what glass to use to how to describe flavors this book will help you fake knowledge about wine. Made for the American market for American wine drinkers with only a nod to the most famous European wines, the focus is on Californian wines and Oregon (Really, Oregon? I had no idea they made wine in Oregon). This book will appeal to anyone looking to appear knowledgeable about wine. We listened to the book while driving from one degustation to the next in Burgundy, and there was little mention of wines from this area. There were some entertaining points, but I think the best way to learn about wine is to talk to people who love wine and drink a little while you are listening to them. Another disappointment was the narrow focus on Champagne while fully ignoring all other sparkling wines like Prosecco or Cava. I did end up giving it three stars because I truly enjoyed the section about the American obsession with grape varieties, which, by the way, is ruining the French wine industry. Our favorite winemaker in Provence has been blending wines for generations to create a uniquely drinkable wine, has started producing a Merlot for export. Why? Because American consumers believe that certain grapes are better than others. Like you would forsake Granny Smiths the rest of your life, eating only Gala apples? You would not do that! Admit it. So, I was genuinely happy when this chapter concluded that if you are hooked on a grape type you don’t get it, go back to your beer. Which is what we have been mumbling about for years, or at least every time I hear someone order a “Char”. This is a great primer for anyone who wants to learn more about wines and wine terminology. I learned some interesting things and this book explains things clearly and succinctly. The one thing I realized while reading this is that I actually don't care that much. There are other things in the world that are much more interesting to me. I read this fascinating book during my wine drinking phase. My dad got this book for me as a joke because he knows how much I love my wine. lol I actually ended up reading it and glad I did. I have an even greater appreciation for wine... there is so much to know! It is really easy to read, and I especially liked learning about the different types of wine made all over the world. There is something in here for every level, whether you're a novice or a connoisseur. As a wine producer it is important for me not only to know about the type of wines I produce, but also to have knowledge about other wine making regions. This book delivers great content; easy to read, sometimes funny, and like the title suggest, for dummies. If you are slightly interested in knowing about regions and some other curiosities about winemaking, this is a good read. I read this when I started to get serious about wines and it was great. Easy to read, interesting, and very enjoyable. My favorite thing was learning all the correct pronunciations... nobody wants to be that person at a fancy wine gathering! Everything I expected in a primer. Just in time to get my snob on at the holiday parties. Easy read, entertaining and great for a new wine drinker who wishes to learn about all type's of wine. Clear cut wine insight & practical advise. Good! I learned some new things and it was really easy reading! This is a good basic overview of wine and wine purchasing. The book focuses mostly on what labels tell you, myths of wine, and the vocabulary behind the subject. Critics of the book have pointed out that the authors spend a lot of time focused on the main wine producing areas of the world (France, Italy, California, etc.) and don't get into the smaller production areas. I think that makes sense in a book like this. There is plenty of information for getting you started on decoding variety of grap This is a good basic overview of wine and wine purchasing. The book focuses mostly on what labels tell you, myths of wine, and the vocabulary behind the subject. Critics of the book have pointed out that the authors spend a lot of time focused on the main wine producing areas of the world (France, Italy, California, etc.) and don't get into the smaller production areas. I think that makes sense in a book like this. There is plenty of information for getting you started on decoding variety of grapes and regions of growing, but if you want to know smaller areas of wine, you will have to do more exploring. This book is ideal for people trying to discover "their" wine of choice and how to best shop and serve wine. It is not for people looking for regional, in-depth information on a variety of vintners. While the authors have wine backgrounds and give some nice backgrounds, the give off the aura of wine snobs. Most of the wines discussed are from Europe, California, or New York giving the impression that these are the two states are the only quality wine producers. There are over a hundred wineries in Texas alone which produce some excellent vintages. Also Duplin County winery in North Carolina and Nissey Winery iin Pennsylvania produce wines better than most of California or New York. Considering how vast the world of wine is, this book is a great place to start. There is loads of practical information presented in an approachable format along with plenty of good advice. I feel way more educated on the topic of wine and found the book full of fascinating content. I can now more confidently select and serve wine and have more fun doing it. In the word's of Major Payne, "Who's the dummy now?" Good overview of the world of wine. I especially like the appendix for definitions and pronunciation of non-English wine words. The authors also suggest notable producers in the major wine categories. This is helpful in the exploration stage and I have been using their suggestions to good effect. A nicely plain approach to wine, with none of the pompousness that scares so many people off, myself included. The author keeps for a main theme: if the wine tastes good to you, drink it, if not, don’t. The rest is really just extras that gives you something to talk about at fancy parties. A wonderfully irrelevant introduction to the surprisingly not overwhelming world of wine. 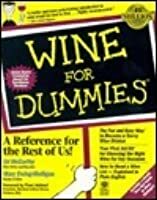 This is a very functional wine reference book which taught some people in our system things about wine they did not know, and which if we owned it (we do not it is a library ebook) would be very useful for looking things up about wine. So maybe we will buy a copy! As A relative wine novice I found this a good introduction to the world of wine. I was familiar with with the styles of wine out of California but didn't know much about European wine. I now feel like I have a basis for begging to explore wine from other regions.